When the first day of the new school year starts in Afghanistan on Thursday, 3.7 million boys and girls wonâ€™t be in attendance, because of increased violence, displacement and poverty. The total number â€” roughly one in three school-age Afghan children â€” is expected to grow this year as violence between Afghan forces and the Taliban intensifies, and Pakistan forces Afghan refugees to return home, according to Save the Children, an advocacy group. We spoke to five of those children. Here are their stories in their own words; they have been translated and edited. 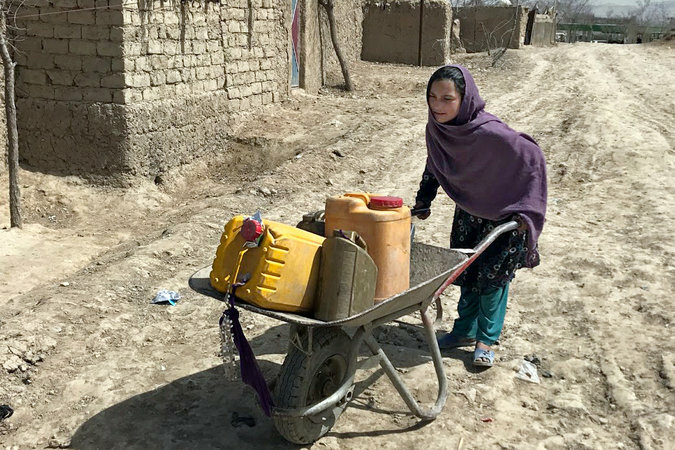 Lina, 12, is from Kapisa Province in northeastern Afghanistan, but her family was displaced by fighting seven years ago. She now lives in a refugee camp in Kabul. She went to school for three years before being pulled out. I loved going to school, but we donâ€™t have enough money to buy notebooks and other things. Our relatives are angry at us for leaving school, but without notebooks it was not possible to study and do homework. If I donâ€™t go to school, I will become nothing in the future; if I go to school, I will become a doctor. I want to become a doctor. We live in tents here; we have two tents. I sleep with my five brothers and sisters in one tent, and my father, mother and two small sisters sleep in the other. For breakfast, if something is left over from dinner we eat that. If not, we eat bread with tea. After breakfast, I bring water from the well, which is a one-hour walk away. Providing drinking water for our home is my responsibility, and I bring water in a wheelbarrow, in these small barrels, two or three times a day. I also collect small pieces of wood and plastic to burn for heating our home. Zahid, 8, is from Surkh Rod, a district in eastern Nangarhar Province. He and his four siblings help his father collect metal scraps in Jalalabad, a nearby city. All members of my family sleep in one room that we rent for $25 a month. After waking, I wash my face, then I eat my breakfast, which is tea with bread, and then I take my sack and go to the bazaar. During the day, I collect scraps of metal, wood and paper. For lunch, I wait in front of a bakery â€” the baker himself or someone else gives me a loaf of bread that I share with my friend or my cousin. We sell the things we collect during the day for 20 cents, and then I bring the money home and we buy tea, sugar or something else with it. In a whole day, the most I earn is 50 cents. I do not go to school because we donâ€™t have money to pay school expenses. The 20 cents I earn is to pay for sugar and tea. My relatives and friends are going to school, and when I see them, I wish I would be able to go to school and do my studies, too. If you go to school, you will have a good future. If you donâ€™t, you will not. Raqibullah, 12, is from a village on the outskirts of Tirin Kot, a city in Oruzgan Province in southern Afghanistan. His father was killed a year and a half ago by a blast from an improvised explosive device. Raqibullah then moved to Tirin Kot. When I was in the village, I was going to school, but there are no schools there anymore. I only studied up to fourth grade, but I can still read and write. In the city, I sell sweets from a cart to feed my siblings. I have three brothers and three sisters, and we all live together. My oldest brother is 14 years old, and the youngest in our family is my 4-year-old sister. My older brother is also working with me. If my father were alive, I would not be spending the day in the bazaar selling things. My cousins are still in the village, where there is no school. But my neighbors here â€” they attend private school and government schools. When I see boys going to school, I really feel like I should be going, too. But I have to earn money in order to feed my family and afford the rent. Bakhti, 13, is from the northern city of Mazar-i-Sharif. Her mother died of hepatitis B three years ago. Her father, who works as a day laborer in Iran, left her and her younger brothers in Kabul with their uncle. I wake up around 6 a.m. After breakfast, I do the housework â€” cleaning, sweeping inside and outside, washing the dishes. If there is a carpet in progress, then I get to help weave the carpet. From each carpet, I get about 80 cents as a tip. The rest of the money goes to the house expenses. Last time from the 80 cents, I bought a comb for myself and socks for my brothers. I also stopped going because my two brothers are alone. I am afraid they will get lost â€” I have to stay and look after them. If my mother was around, I would study. But now I canâ€™t. My cousins go to school. Those who go to school, they look good. I also want to go to school, but it is not going to happen. Imamuddin, 15, is from Charchino District in Oruzgan Province. After intense fighting in the district, which is now controlled by the Taliban, his father moved half of the family to Tirin Kot. I studied up to fifth grade in our district, but schools closed a year ago because of fighting, and now the Taliban control our village. There was fighting every day, and I wasnâ€™t even able to leave our house. My mother and five sisters are still in the district; we are trying to bring them here soon. We live in a rented house, which has three rooms, and we pay about $60 a month for rent. My father, two brothers and I share one room. Itâ€™s winter, and to keep a room warm needs a lot of wood, and we can hardly make one room warm. Life is hard for me here because I do nothing. I am very bored. But I am happy when night comes, and at least I can go to sleep. I really want to become a doctor and serve the people. I am asking my father to send me to English classes in Tirin Kot, but my father cannot afford the fees. I am studying my old books from school, and I have completed each book many times. I may start working, or move to another province where we can find a better living. I am worried about my future and education. Life was good back in the district â€” we had a good living, we had land and orchards and schools and fellow students â€” but here you do not know anybody. Fighting deprived us of everything.